On the development front SHW are marketing Astley House, (20,507 sq ft, pictured above) a former vehicle workshop and stores which was most recently operated by Sussex Police. 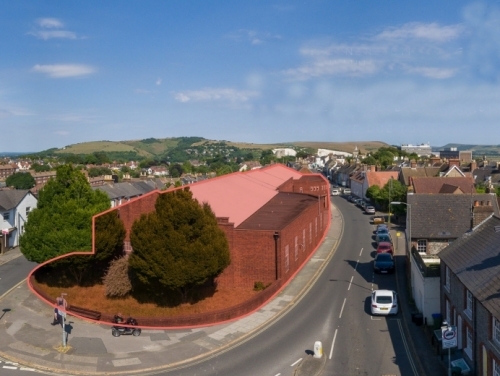 The building sits on a 0.66 acre site and offers a unique opportunity to acquire a development opportunity (subject to planning) in East Sussex’s County Town. The owner has instructed SHW to call for best bids with a deadline set for 9th November 2018. If you wish to put forward a proposal, please contact SHW for further details. See brochure - https://bit.ly/2xqcFTB. For those requiring offices, Sackville House is available on the northern edge of the town centre. Sackville House is a modern 3 storey office building. The available suites are arranged over the ground and first floor, and provide predominately open plan office space from circa 2,000 to 20,000 sq ft. For more details - https://bit.ly/2PpQaWI. Retail-wise, SHW have recently agreed terms for a trade counter unit (4,446 sq ft) on Brooks Road, an already busy trading estate in the town - https://bit.ly/2CyE7n0. SHW are also letting the Grade II-Listed 77 High Street (A1/A2 usage, 1,332 sq ft across two floors) – for more details visit https://bit.ly/2A0uKdu.